Welcome to the featured homes page. 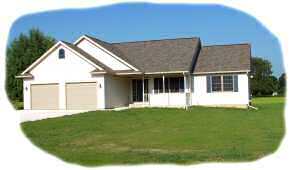 This beautiful 1547 square foot single story ranch style home is warm and inviting. Upon entrance you will find an elegantly designed ceramic tiled floor which is the focal point of the foyer. The family room is generously proportioned enough for it to be separated into individual dining areas and is open to the family dining area. The sliding glass doors in the dining area make the back patio/porch ideally accessible for summer cookouts. Kitchens are always the most popular areas in the house and this one will be no exception. An extended counter works as a bar or serving space into the dining area. The kitchen comes with oak stained cabinets, spacious closet style pantry and an extra large ceramic double sink. The family room, dining room and kitchen all feature vaulted ceilings. A separate hallway on the opposite side of the house leads to bedrooms one and two. Both bedrooms are very roomy and include spacious closets and large windows. Nearby is the bathroom with a large linen closet just outside the door in the hallway. The master bed and bath is a good size with a unique tray ceiling and walk in closet. In the master bath you will find a double sink and cabinets with a make up and vanity in between. In this bathroom you will find lots of storage with an extra large linen closet which includes wire shelving. One of the most convenient amenities of this home is the first floor hidden laundry area. Two double doors in the hallway store a full size washer and dryer with a storage shelf above them. The basement of this home is large and ready to be finished if the homeowner desires. Nine foot ceilings and an egress basement window make your options almost limitless. This beautiful 1664 square foot single story ranch style home is a cost effective alternative to a modular home. This home may look simple but actually has more features and space than a modular home of the same price range. The family and dining rooms are large open spaces with vaulted ceilings that the homeowner can divide to their liking. Large windows and a sliding door allow for natural light into the large open floor plan of this home. A generously sized kitchen boasts lots of cabinet room and dining area. The master bedroom is spacious and features tray ceilings with surrounding canned lights that can be set to your desired lighting level with a dimmer. A walk in closet and a master bath is almost as large as the bedroom itself. In the master bath you will find a shower and whirlpool tub along with his and her sinks and large storage cabinets. On the opposite side of the house you will find two bedrooms with large closets and a shared bathroom with linen closet. This home design also has a main floor laundry room that can be accessed from the garage as well. An open stairway near the main entrance in the family room leads to your nine foot tall unfinished basement complete with two egress windows. You may have noticed that many of these features you will not find with a modular home. Included with your Muehlberger Custom Home are wire shelving in your closets, six panel interior doors, sound deadening insulation, 2x12 floor joists, textured ceilings and much more. This home was built, from excavation of site to giving the homeowners their keys, complete in 87 days! Our job is to make your dream home become a reality.